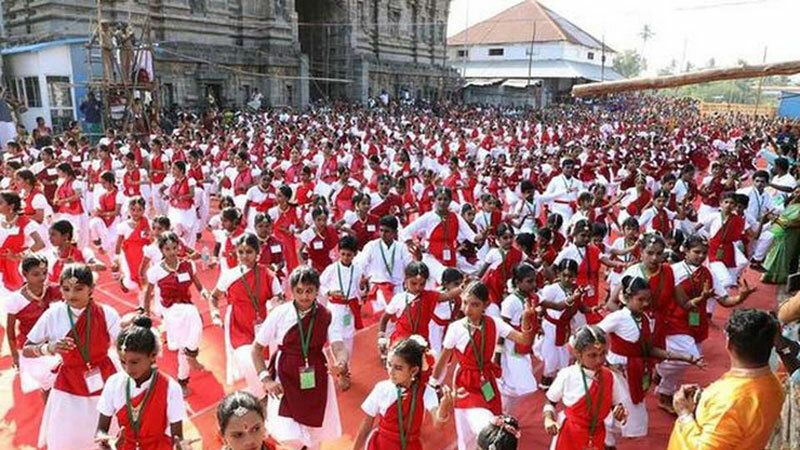 Over 7,000 Bharatanatyam dancers set a world record for the maximum number of people performing the classical dance form at the Natyanjali fete in Sabanayagar Temple also known as Sri Natarajar Temple in Chidambaram on Sunday. The event was inaugurated by Bharatanatyam dancer Padma Subrahmanyam. The record creating dance was performed in unison by 7,190 dancers from various age groups. The certificate for the feat was handed over to Nadaraja Moorthy Dikshithar, treasurer of the Thillai Natyanjali Trust, by Rishi Nath, adjudicator from the Guinness Book of World Records. The participants broke the record set by 4,525 dancers in Chennai in 2017. According to Mr. Nath, the minimum requirement to attempt an entry into the records is 5 minutes. Though more than 7,000 dancers performed for nearly 14 minutes, the mobile barcode scanning of participants got jammed due to poor net connectivity and the number of participants was arrived at based on the time limit, he said. The Thillai Natyanjali Trust started planning the event eight months back. The trust had originally planned the event on March 7, but preponed it to Sunday to ensure maximum participation. The participants, aged between 5 and 40, have been training over the past few months.